Kyoto is a beautiful city to visit but it can get expensive. Here are our top 10 picks of fun and free things to do in Kyoto that you don’t want to miss. Did you know there are some great fun and free things to do in Kyoto city? I heard so many times as I was planning our trips to Japan what a terribly expensive place it was to visit. I’d be the first to agree that Japan is not a budget travellers dream. On the other hand it’s not nearly as expensive as I’d expected it to be from the hype and fear mongering. It is possible to fully experience Japan’s unique culture, foodie delights and landscape without totally destroying your travel budget. What did surprise me though is that there are things you can do in Japans biggest tourist destinations and cities that won’t cost you a cent. Of course you don’t want to build your travel around doing only free stuff because you’ll miss some wonderful experiences but when there are really good bargains on offer you don’t want to overlook them either. So if you’re pondering what to see and do in Kyoto then read on. These 10 ideas are fabulous and fun options. Most are centrally located in the city or not far from it so you won’t have any significant transport costs either. 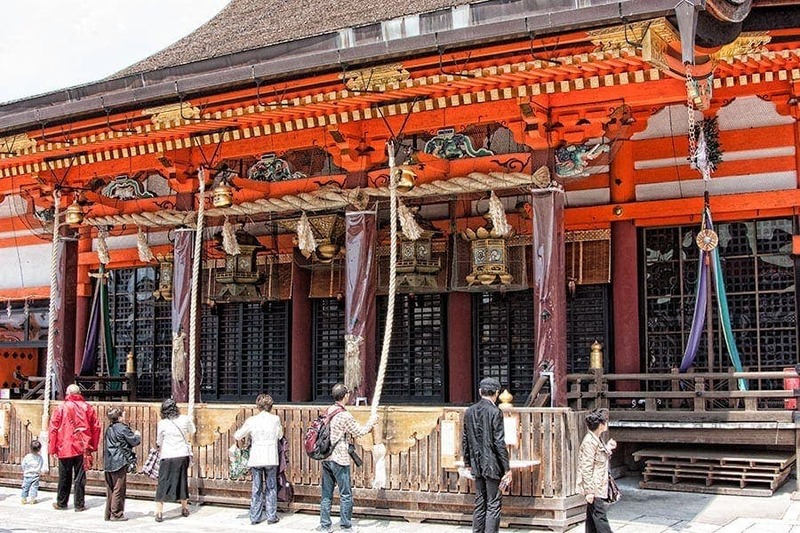 This is the head shrine of Inari and even if you are only going to visit a couple of Shinto shrines across Japan this one should be on your list. It’s in southern Kyoto and a 5 minute train ride from Kyoto station. The shrine itself is quite large and a good example of the Shinto layout but what’s unique about it is all the vermillion tori gates. Most shrines have a couple, especially at the entrance and leading up to the entrance but there are corridors of these gates that weave through the shrine itself and then right up Inari mountain behind it. Not only is the walk up the mountain interesting and something quite different with all these torii but the view from the top of the mountain over Kyoto on a clear day is worth the climb alone. As an important shrine in Kyoto, Fushimi Inari also hosts a variety of events during the year such as Kenka sai that we were able to attend in the spring. If you time it right you might also catch services or even a Shinto wedding in progress. Entry to Fushimi Inari like all Shinto shrines is free and it’s open 24/7. I find the kimono one of the most striking forms of traditional dress which is probably why some Japanese women will still wear it today, at least for special occasions. You’ll see kimono and yakata worn in Kyoto especially during the cherry blossom, autumn foliage and other festival times. The Nishijin textile centre gives you an opportunity to see kimono styled and worn in a kimono fashion parade several times a day. The show is free to attend and you also have the opportunity to see a display of silk worms that produce the luxurious fabric and weaving demonstrations that show how some of the more elaborate fabrics and wall hangings are created. The Nishijin Textile Centre is about 1 km from the Imperial Palace or 1.5 km from Nijo Castle so is quite easy to incorporate in with other activities you might be planning in the city. This 400 year old traditional food market is built on a stone paved lane above Kyoto’s groundwater spring system. There are over 100 small stalls, shops and restaurants to explore along this 400 metre alley way. Many of the store owners welcome browsing and may offer you samples of some of the unique local cuisine as you go. At the eastern end is Nishiki hachiman-gu shrine which marks the centre of old Kyoto. Read more about our wanders through Nishiki market and some of the things to keep an eye out for. One of the highlights of spending time in this beautiful city is talking a walk through the historic hanamachi before or after dinner. Hanamachi are the districts where geisha live and work and the traditional buildings have been maintained in these areas. Just to be clear I’m not for a moment suggest you go stalking geisha as they go about their business. 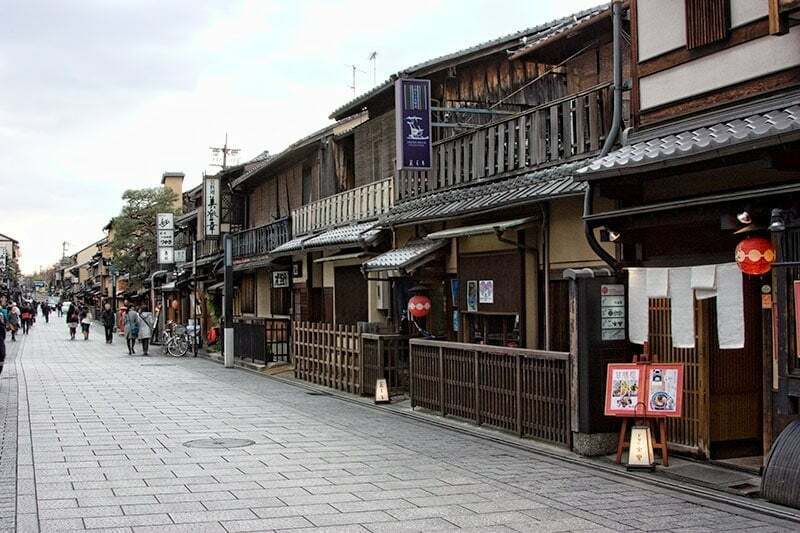 Kyoto is a very safe city for walking and these dimly lit old streets are a lovely evening walk with the bonus that you might spot a geisha as they move between the okiya and the restaurants and ochaya where they entertain. It’s like a momentary step back in time. These women not only possess talent in the arts of dance and music but great poise as they move rapidly from one engagement to another in their stunning but heavy kimono and tall geta. If you are lucky enough to pass them in the street respect them and don’t crowd them or delay them. When they’re out and about in full makeup they are generally on their way to work. 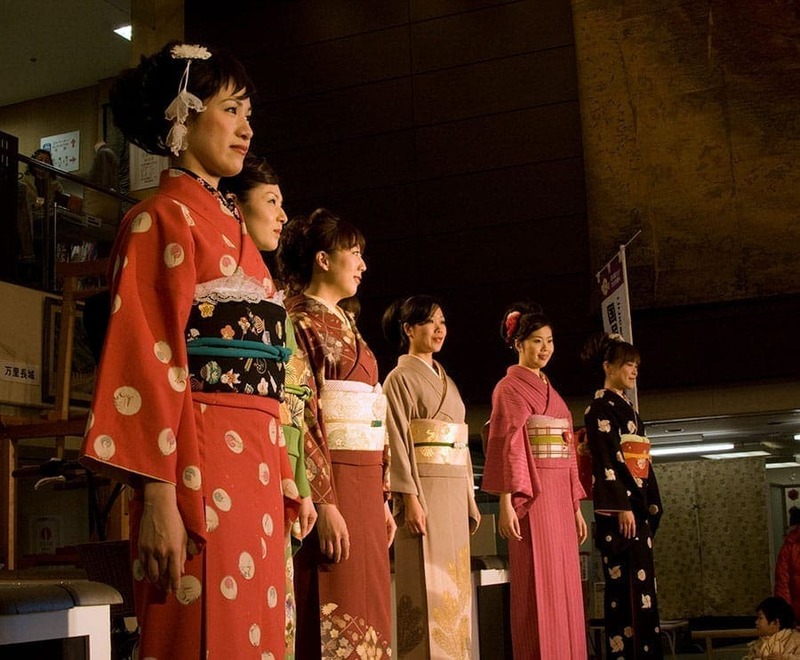 You’ll find more information on Kyoto’s 5 geisha districts in this post. This historical stone path runs along the banks of a small section of the Lake Biwa canal below Kyoto’s eastern hills. 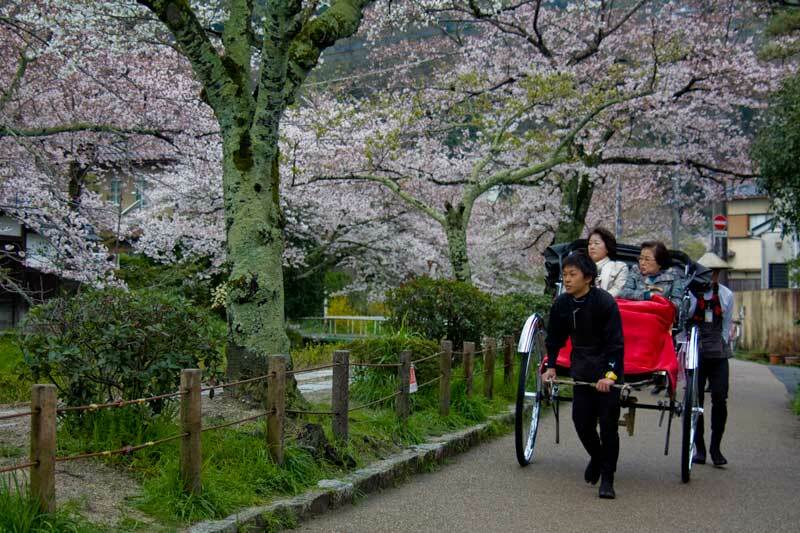 The walkway is best known as a cherry blossom viewing site but it’s a calm and attractive spot in all seasons. As you stroll along the 2 km length there are a variety of restaurants, shops, cafes and temples to explore. Read more about the attractions along the Philosopher Path in this article from our spring visits. The Imperial Palace in Kyoto was home to the emperor of Japan during the Heian period and this impressive palace and gardens remain from that time. On our first visit here we booked on the (free) guided English tour, the second time was during the special spring opening when you can wander around on your own. In late 2016 they will do away with the guided tour and move to free opening through out the year making it even easier to experience it. This one is definitely worth an hour or so of your time either on the tour or to wander through on your own for the architecture, history and beautiful garden. The scale is dramatic. 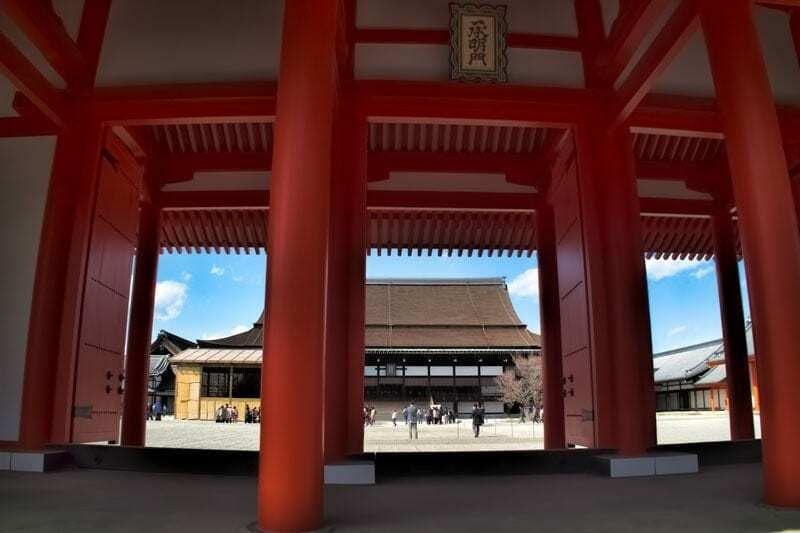 If you’ve done the Tokyo imperial palace tour and it wasn’t really your thing don’t be put off, the Kyoto site is very different. With Fushimi Inari already on the list I contemplated not adding a second shrine but I do love Yasaka and think it deserves its place. It’s located in the Gion district and is sometimes referred to as Gion Shrine, an indication of its close link with the geisha from the nearby hanamachi. Yasaka shrine is one of the few places I’ve seen geisha perform at a local event and the shrine is heavily involved in many celebrations and festivals. It’s the place to be in Kyoto for New Year and it’s the host shrine to the popular Gion Matsuri, Kyotos biggest festival. Maruyama park is considered a fairly new park in the context of Kyotos long history. Only 300 years ago it was a piece of waste land overrun with weeds until it was designated as a park in 1886. It was made over into its current design by Jihai Ogawa, a landscape gardener known for his other prestigious garden designs around the city including Heian shrine. It’s a traditional style park with walk paths, ponds, decorative bridges and statues. The park is possibly best known as Kyoto’s premier hanami party spot during the cherry blossom season, the celebration known as Gion-no-Yozakura brings out many locals to eat and drink under the cherry trees. It does get a bit rowdy by Kyoto standards but never felt unsafe. 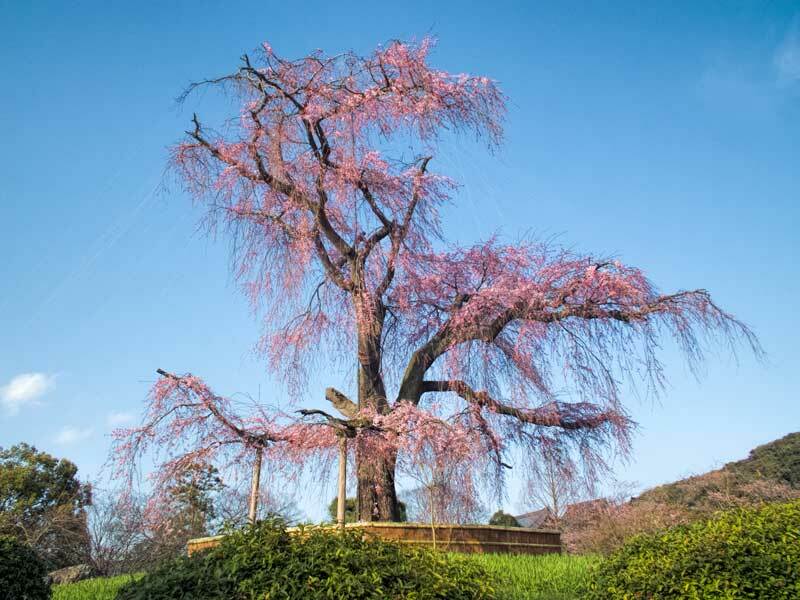 A large weeping cherry tree (shidarezakura) is in the centre of the park and is a stunning display in season. The current tree is a second generation tree planted in 1949. It was seeded from the original tree that lived to be 200 years old with a trunk 4 meters around it’s base and was featured in many famous old paintings. The park is located in Gion in central Kyoto, directly behind the Yasaka shrine. There are several entrances into the park and it’s a pretty green space all year round. During festivals it’s transformed with yatai, the small portable food carts that appear and produce incredibly tasty treats from their small size. There are also many free events in the city all through the year. Festivals and events give the opportunity to see a bit of the local community and way of life too. We’ve managed to find something exciting happening during each visit but some of the highlights to watch out for when you visit are the Gion, Aoi and Jidai Festivals, New Year celebrations, Setsubun and of course the seasonal events. Sakura season, the cherry blossom is a fabulous time to be in Japan and Kyoto is one of the best cities for it in our opinion. There are trees in bloom and paths and rivers carpeted in pink petals all around the city. 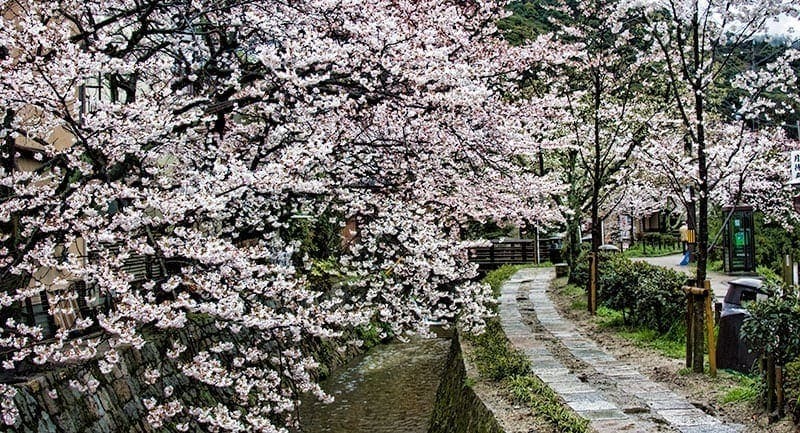 We particularly like the hanami parties in Marayama park and along the river bank, or the walk to dinner along the canal areas near pontocho and shirakawa, both historical geisha districts in the central city. Take a look at this page for our suggestions on the best sakura viewing spots in Kyoto, many of them are free. Another great free event is the dragon making it’ rare but highly anticipated appearance at Kiyomizudera temple. Now I know a train station doesn’t sound like an enticing and fun destination but give it a chance. Firstly it’s a really unique and somewhat controversial building being an ultra modern gateway to a city that prides itself on its history and tradition. While you are there ride the escalators and climb the final flights of stairs to the top for great views out over Kyoto. From the 11th floor access the sky walk floating above the station below for more great views, this is especially good in the evening. There is a sky garden on level 15 and various other surprising quiet public spaces for relaxing on level 11. The fountain and stairs are usually lit up in the evenings often with themed displays and of course there are no end of browsing and eating opportunities directly accessed from the station. 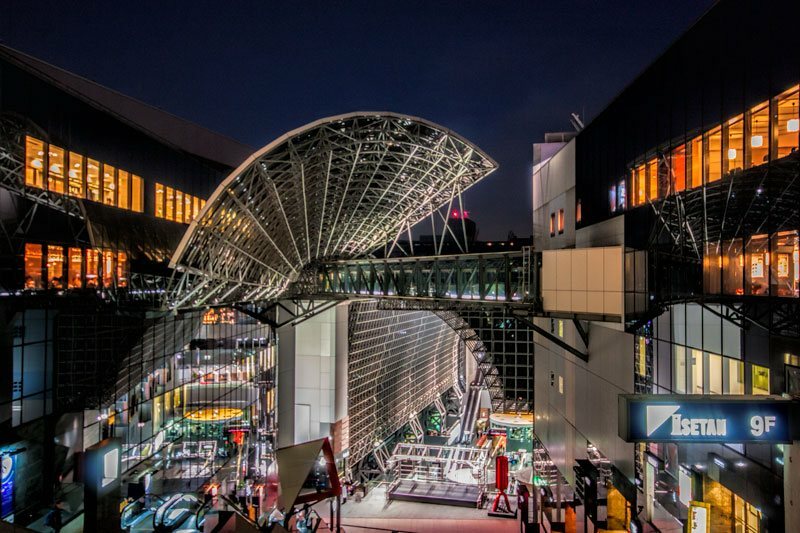 You can read more about Kyoto station, the starting point for our eastern Kyoto self guided walking tour in this post. So there you have it, 10 fun and absolutely free things to do in Kyoto, some fabulous additions to any itinerary. Have you spent time in Kyoto? Which of the places and activities are your favourite or do you have others to add? Please share your own experiences in the comments below. Love your blog. Do you have a map for your Evening Gion Walk? You really do have the most useful information I have come across. Hi Keri, Thank you. I don’t have a map or walking guide on the site at the moment but I’m headed back to Kyoto next month and it’s on my list to do this time. I’m not sure when you’re going but hopefully that might still be in time for you. Hi, just wanted to let you know that your blog post is informative and insightful, helping a budget traveller like me out a lot. But I have 1 question, is it cheaper/easier to travel using the discover Kyoto 2 day pass vs just using JR pass and suica for a 2day tour around Kyoto? Thanks Steve. It will depend on what your plans are and if you already will have an active JR pass while you are there? 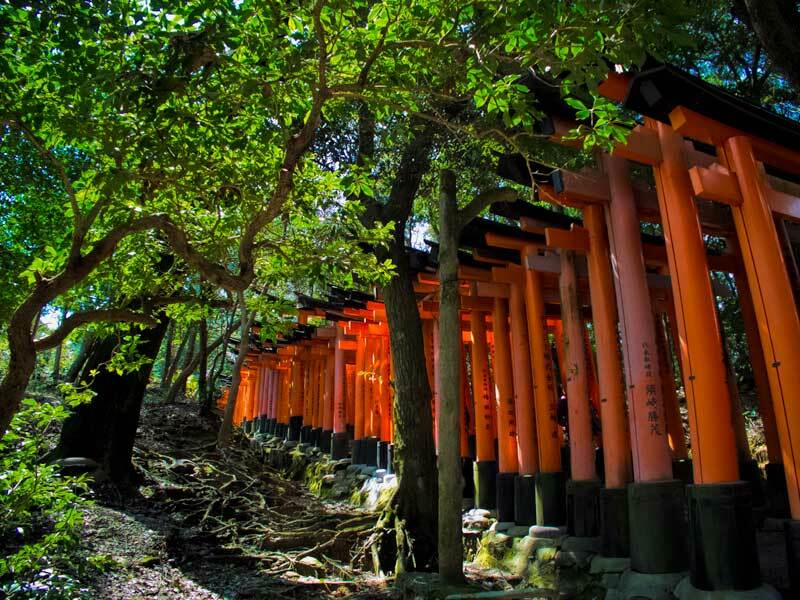 You’ll need JR or another train to get to places like Fushimi Inari and Arashiyama. I think the Kyoto pass is Y1700 so it will depend on how much you plan to walk and how often you’ll use the bus or subway, it’s quite a compact city with a lot to see, we walk a lot between attractions so I prefer our suica/icoca and just use it when we need it as I wouldn’t get the value from the pass. Where you are staying might also make a difference to the value you get from it. I’ll have an active JR pass as I’m travelling downwards from Tokyo. The places I plan to is probably fushima inari, arashimaya and higashima. Staying at a hotel in higashima ward, but pretty unsure of the travelling routes as I’m travelling to Japan for the 1st time 😅. Mind if you give an opinion? so that I can buy/don’t buy the kyoto pass and assure myself to not hesitate. The hyperdia.com website is useful, you can find out the closest station to where you are staying and then input where you are going and it will give you the best routes for where you want to go and the costs. We will arrive in Kyoto on June 18, so yes, that would be great!! I would love to see what you end up doing in Kyoto. We are there 4 nights and I have two day trips scheduled one to Nara and one to Enryakuji which might be one day trip too many. I have to keep Nara because my daughter is super excited about the deer. Could you suggest on which place to go to in Kyoto if i only have 1 day, arriving in the morning from Nara but staying overnight in Kyoto to depart early morning to Tokyo. I would like to visit Arashiyama, Kinkakuji, Nishiki market, Fushimi Inari, Kiyomizudera, Gion. Maybe sannenzaka and ninnenzaka if possible. staying in a guesthouse near Omiya station. Also which is better to take bus to visit those places or can train access it ? cause my friend told me that it’s more of a bus city in Kyoto rather than train. thanks. Hi Catrina. Kyoto has a very simple 2 line subway system and a lot of the inner city attractions aren’t on a train line, that will be why your friend has said it’s more of a bus city as they go everywhere. However they are also quite slow as they stop often and are cramped. With only one day that would be a lot of places to get through so you may want to consider which are most important to you but I have a few suggestions to fit in as much as you can. It may also depend when you are going, days are short in winter and in spring you have the lightups which can extend your visiting time to places such as Kiyomizudera into the evening. You are coming from Nara so Fushimi Inari is on your way and it never closes, if you are a morning person get there as early as you can, not only will you maximise your day but it is at it’s best in the very early morning before the crowds arrive, you feel the old peaceful energy of the shrine and the walk through the forest and tori gates is beautiful then. Continue on the train back to Kyoto station and then getting on the next one out to Arashiyama would make the most sense next, what do you want to do there? There is a lot but it is like a beautiful suburb of Kyoto so things are spread out and you could easily spend a day there alone. These are some of our favourite spots in Arashiyama. Take the train back to Kyoto station and go to the bus station outside the main doors, catch the next bus to Kinkakuji. The info centre staff speak good English and will point you in the direction of the best bus, it may not always be the tourist circuit bus. When leaving Kinkakuji the bus will likely come back via the centre of Kyoto and would be best to get off there to continue on with the rest of your stops, there is no need to go right back to the station. If you want to save time here and budget is less of a concern you may consider a taxi from Kinkakuji to Kiyomizudera or the next stop, the bus will eat into the available time. 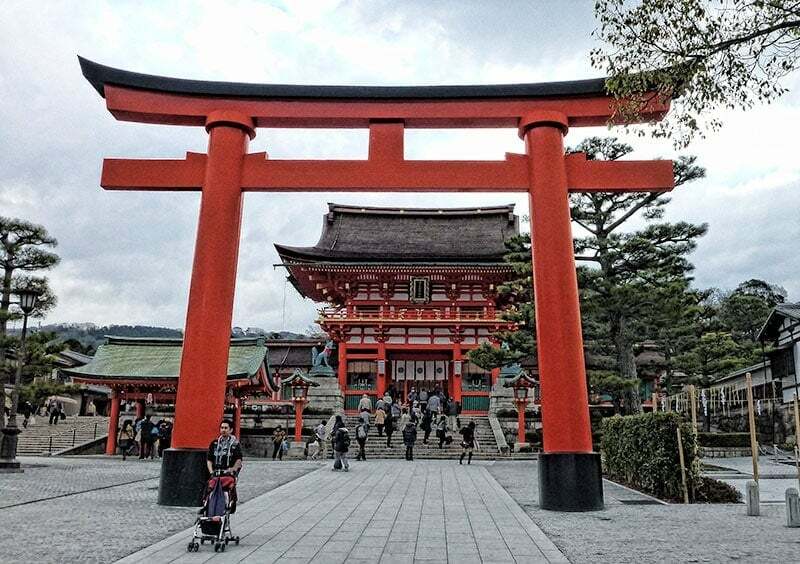 Kiyomizudera,Gion, Sannenzaka, Ninnenzaka and to some degree Nishiki Market are fairly close together, walking distance, and can be done later afternoon. Evening is good too but the experience is different after dark but it may be an option if you are struggling to fit the other places in. I hope that helps, have a great trip! If you plan to have a wifi then Google Maps and Hyperdia will be very useful on your day in Kyoto. Thank you for your reply and explanation it really help with my route. I will be going to kyoto on 13 April. So i can stop directly to Fushimi Inari woth train from Nara, can i know the station name to stop in Fushimi Inari from Kintetsu Nara station (the closest from my hostel). I am on budget constraints I’m afraid :(. Thank you. Hi Catrina. I’d walk through to the JR Nara station (about a km from Kintetsu) and go through to Inari station on the JR line which is a very short walk to Fushimi Inari. I don’t think the Kintetsu (a private railway) goes through Fushimi. Thanks for your advice.i’ve rechecked my hostel is near the park rather than the station. Is there any bus from the park to nara starion? Other than walk. thank you. Hi Hanny, without knowing which hostel I can’t be sure, the park is large so will depend on what side the hostel is on but the yellow Nara loop buses run on a circuit that includes both stations. You can find more information here. There are regular local buses too and I suspect your hostel will be able to point you in the direction of the right bus to catch. Hi Toni, i’ve just rechecked my hostel apparently is near the park and not near any of those train station (i have to walk about 20 minutes from the hostel either to Kintetsu or Nara station). is there any bus from the park to Nara station? Another question, will it be worth it if i buy the one day bus pass in Kyoto for my trip there? Without knowing which hostel I can’t be sure, the park is large so will depend on what side the hostel is on but the yellow Nara loop buses run on a circuit that includes both stations. You can find more information here. There are regular local buses too and I suspect your hostel will be able to point you in the direction of the right bus to catch. Thank you Toni, iam sorry my friend also ask the same thing. It’s kamunabi hostel. We will be sure to ask the hostel people for the bus direction. A loop bus stop is very close to Kamunabi Guesthouse so that should work well from either station, have a great trip! Thank a lot for your info. It really really helps, another question does Inari station have any lockers for luggage storage? since we will be coming in from Nara and before arriving at our hostel. Hello Toni I was directed by your friend Megan who recommended me to have a look at the articles about Japan travel on your website. I am amazed to see so much of intricate information which wikipedia also would’nt provide. I am planning a trip from 5th Sept to 16th Sept 2018. The places which I would like to cover are Tokyo-Mt Fuji-Hakone-Kyoto-Hiroshima-Osaka-Takayama. I am a person who likes culture, custom,traditions more over modern and digital living. Hi Mustafa, do you mean to do the 7 destinations in 10 days? It is very ambitious and will not leave you much time to explore especially as some such as Takayama and Fuji 5 Lakes district aren’t directly on the main train lines so can involve longer periods of travel. For example it’s a 5 hour highway bus if you want to go direct between Fuji and Takayama which would be a logical flow then another 3 hours by fast train down to Kyoto. Have you identified the key things that are on your ‘must do’ list for each place? That and budget will determine the time spent in each and as there are so many types of travellers it is hard to give a costing as it varies so much, some will stay in a hostel and buy meals from the corner store, others want the ryokan experience or international hotels and to try many local specialty restaurants as part of their experience. Japan generally is a relatively expensive country to travel in, similar perhaps to the USA and Australia but having said that you can usually trade off time for cost and make choices that fit your budget. Hello Toni, I heard that Kyoto can be really crowded? I’m planning a trip to Japan and I can’t decide which place to visit first- Tokyo or Kyoto. I’d love to hear about your recommendations. Thanks! It depends where you are from I guess but to us all Japans major cities are crowded. We noticed the crowds most of all in Tokyo, then Osaka then Kyoto but during busy times on the subway or peak season there are a lot of people. Choosing between Tokyo and Kyoto is more about what you enjoy. If you’re mostly interested in the history, culture, gardens and temples and as a base for day trips further afield we love Kyoto, it is our favourite city. We do love Tokyo too but I will only do a few days at a time in the city itself. If you are into manga, electronics, shopping, the quirky aspects of maid cafes, lolitas and capsule hotels, the big city feel of the crowds which are an experience in themselves in some places, then Tokyo is a sensory overload in a good way. Both have some good day trips nearby and amazing food. Your recommendation really made it a lot harder to choose, but now I’m leaning towards seeing Kyoto first. Also because I believe a day-trip to Nara is doable? Thanks Toni! Thanks very much Toni! I’d love to see those adorable deer in Nara and if it’s possible visit Okunoshima and the Fox Village, but that will definitely require a lot of planning and researching. I knew they had a Rabbit Island in Okunoshima but I didn’t know they had foxes around there too. Foxes are so cute, I would love to hear what you think if you manage to get out there. There is another one, Zao Fox village about an hour north of Fukushima but that could be even more difficult and time-consuming to get to. Thanks Ryan, talking of perceptions of expensive travel destination NYC would have to be right up there or is that home for you now? This post brings back lots of great memories! I love the blossom in some of your pics – next time I go to Kyoto I want to go during the spring to see it. I’ve always loved the Philosopher’s Walk, and the history behind it. 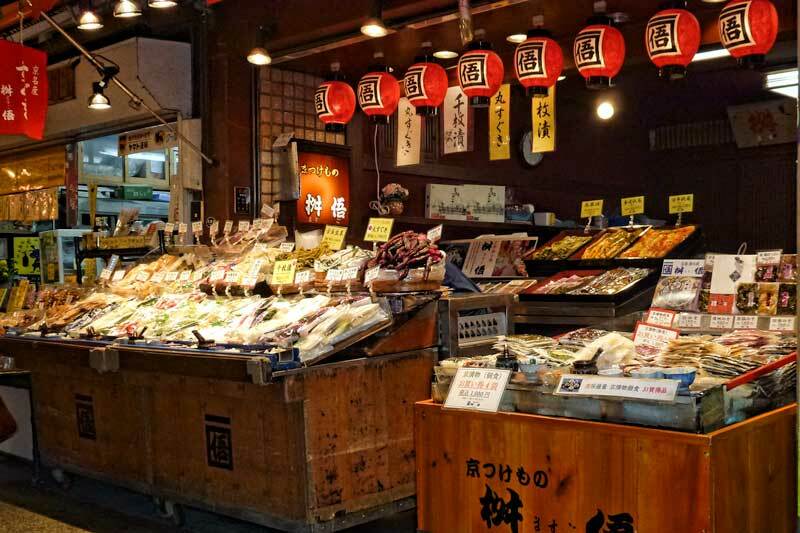 I’ve never been to the Nishiki Market – I look forward to exploring it, hopefully next year. Thanks for the recommendations. It’s such an amazing city, I’m sure I’ll never run out of reasons to go back. Do you have a season in mind you will visit for? I think next time we will aim for the autumn. Thanks Wai, it is a great spot. We’ve walked it a couple of times during cherry blossom season but it is such a lovely part of the city I’d recommend it at any time of the year. Thanks Stephen, it’s a fabulous city. Great write-up! This will definitely be handy for my family trip to Kyoto next year. 1) I visited a number of temples and my favorites were the Golden Pavilion (Kinkaku-ji) and another whose name I can’t recall but which had lots of bamboo and then an almost ‘fairy-like’ area I think with a small pond, small statues placed here and there, etc. 2) Not just in Kyoto, but throughout much of Japan, you can arrange for a private tour with Volunteer Tour Guides. There is no fee to use these guides, they all appear to speak Excellent English (among other languages as well), and the only expectation is that you pay their way for any meals you share, their metro fare, and entrance fees to museums/temples, etc. Beyond that, it is always a nice gesture to give your guide a small gift from your homeland. The gift should be wrapped and you should also understand that typically a Japanese person will not open the gift in front of you, but will likely open it later. So you should not expect or pressure them to open the gift in your presence. 3) My favorite area of Kyoto was the section just North of City Hall, and just South of the Imperial Palace. It’s been a long time since I was there, but I seem to recall that I was heading for the famous Ippodo Tea shop, and en route I remember feeling as if this area was more ‘discreetly’ rich and elegant and more ‘classic’ in feeling. I also remember that the shops I passed were much more sophisticated than say the other shopping areas full of crowded shops and brightly colored signs. For example, I seem to recall a beautiful little shop that sold nothing but hand-made items for practicing the art of calligraphy. So for those of you who are really into aesthetic and beautiful hand-made items, I’d recommend you walk through this part of Kyoto. Hi Lynn. Thanks for the great recommendations. We’ve not used the services of the free guides ourselves but have met and talked with a couple of them in various places and walked with them for a while in a few places like the gardens at Osaka castle. They do have excellent English and from our short interactions, an excellent knowledge of the areas they cover.